Q. Non-Catholic friends of mine have asked me about the pope being infallible. I’m not sure how to explain it to them. And how many times has it actually been used? A. Infallibility can be a hard teaching to understand. But for that reason, it makes it all the more rewarding once you grasp this incredible doctrine of our faith. What does “infallibility mean? It means that when the pope teaches us definitively, in either the areas of our faith or moral life, he is guaranteed to teach us the truth! In other words, we can always trust what the pope teaches us. One of the chants among the young people at World Youth Day, when the pope is present, is, “You are Peter! 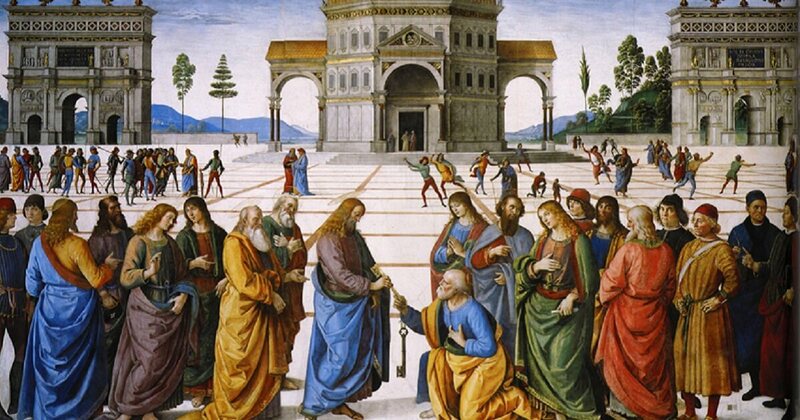 You are Peter!” What does that have to do with papal infallibility? Believe it or not, it reveals a portion of the simple, yet profound faith these young people have in papal infallibility. By chanting this, they are saying that they believe the pope is not only the successor of St. Peter, the prince of the Apostles and the first pope, but that the current pope, and every pope before him, shares in Peter’s authority and spiritual power. So what “power” and spiritual “authority” are we talking about? Let’s turn to the Scripture to find out. Sound confusing? Well, it’s really quite simple. Jesus was telling Peter that he would be the rock foundation of the Church. And if you know anything about a building, the foundation is the first thing down and is essential to the endurance of the structure. Then Jesus went on to explain what this rock foundation was all about. He said, “I will give you the keys to the kingdom of heaven. What you bind on earth will be bound in heaven and what you loose on earth will be loosed in heaven” (16:19). Wow! So Jesus gave Peter the “keys to the kingdom of heaven!” That’s a lot of spiritual authority. The bottom line is that one of the uses of this authority is to teach us the truth without error! This authority to teach the truth is deeply intertwined with our understanding of the infallibility of the pope! That doesn’t mean the pope can tell us when the Cubs will win the World Series, instead, it means that anything that the pope teaches regarding our life of faith or morals is the truth. And when he speaks definitively, it’s infallible! Why does the pope have this authority? Because, as those young people at World Youth Day understood, the “keys to the kingdom,” given to St. Peter by Jesus, have been passed on from him to all of his successors. There is an unbroken line of succession from Peter to the present Pope. So Peter, and his authority to “bind and loose,” is still alive in our Church today in the person of the Holy Father. As for your second question, “how many times has it actually been used,” it’s not really a black and white answer. Some would say that the pope has only exercised this once, in 1950, when he proclaimed that our Blessed Mother was taken body and soul into heaven when her life on earth was complete. If this is confusing, or too much for you to try and explain to your friend, just pray for greater understanding and pray for your friend. Ultimately, it’s only the Holy Spirit who can teach us what this all means.